Yesterday, my daddy came into my room and woke me up. I was confused because it was still kind of dark outside. 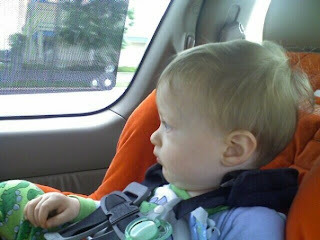 Then, he put me in the van even though I was still in my pajamas! My mama was in the van too. I thought we must be going out to eat because I hadn't had breakfast yet. When we got out of the van, we were somewhere I had never been. Daddy pushed me in my stroller, and we talked to a nice lady. Then we talked to a man who wanted to know lots of things like where I live and where my daddy works. After we waited for a few minutes, a man in a pink shirt came, and we followed him down a long hall to a room with a bed. There were so many things to see. I wanted to touch everything. We waited some more until a lady came in and asked my mama a lot of questions. The lady put something around my leg. She took my temperature under my arm. Then she put a thing with a red light on my foot. I did not like that at all. Miss Sherry came to wait with us. I was so glad to see her! (She is my Sunday School teacher.) While we were waiting, Pastor Joe came to visit us. I played with him. He leads the great big choir at church. Miss Sherry took me for a walk and found a puzzle for me. We took it back to the room with a bed and played with it. Some men in green clothes came and talked to my parents. Then, a lady came and gave me some medicine. It tasted yukky, but she gave me a drink of water after I took it. I started to feel kind of sleepy, but there was still so much to see. A lady wrapped a warm blanket around me. I snuggled with my daddy. Then we left Miss Sherry in the little room, and Mama, Daddy, and I went for a walk. We went into a big room where there were people in beds and more people wearing green clothes and funny hats. Mama and Daddy talked to some more people. A nice man came and put a funny thing in his ears. Then he put the other end on my horsey and then on me. After a few minutes, a nice lady picked me up and took me for another walk, but Mama and Daddy didn't come with me this time. We went to another room with lots of people wearing green clothes. I was getting so sleepy. Someone put a funny thing on my face and then I must have gone to sleep. When I woke up, I was mad! My ears and my back felt funny, and there were stickers on me. There was a thing on my hand that I did not like AT ALL. Another nice lady picked me up and talked to me, but I was still mad. She took me for a walk, and we ran into my mama, daddy, and Miss Sherry! I was glad to see them, but I was still mad. Mama held me for a while, but I was still mad. Daddy held me next, but I was still mad. A lady brought me some juice and I drank and drank because I was so thirsty. Miss Sherry played puzzle with me, but I was still mad. Mama played a Signing Time DVD for me, but I was still mad. Then the juice lady came back with a popsicle and some jello. They felt so good because my throat hurt. I watched cartoons while I ate and sat in Daddy's lap. I didn't feel so mad anymore. Pastor Rus came to visit us. He talked to Mama and Miss Sherry, and I drank some more juice. The juice lady asked if I had wet my diaper. My mama told her I had. Mama says I'm a whiz at that. The juice lady said that meant I could go home. I wanted to go home to my toys and my bed. I said bye-bye to Miss Sherry and bye-bye to the juice lady. Daddy put m e in my orange seat, and I liked that. Mama wanted a treat. Daddy took us to the treat place, and Mama shared her treat with me. I saw lots of people and things I had never seen before, but I was brave. Everyone took good care of me. I came home and took a long nap because it had already been a very long day. 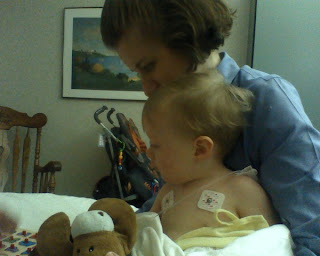 Editor's Note: Adam had outpatient surgery on Wednesday to place ear tubes and remove a congenital nevus from his back. Both procedures were successful. We are so grateful for everyone's concern and prayerful support.